Yesterday, Adobe announced their newest additions to Creative Cloud, and at the same time, also announced that their much-anticipated stylus and digital ruler — formally known as projects Mighty and Napoleon — now known as Adobe Ink and Slide, are available. The event was streamed live over the internet, but was presented live in NYC, and I was lucky enough to be in the live audience. 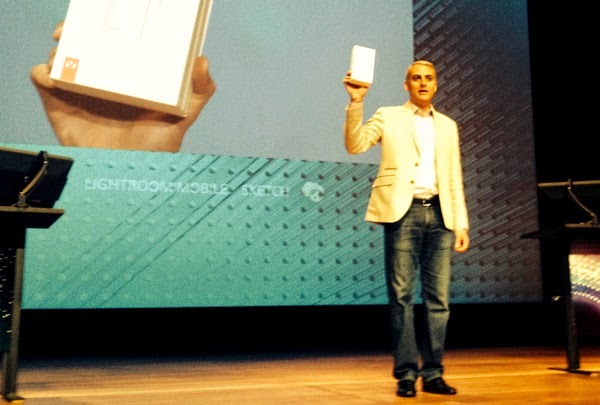 After the event was over (and the live stream ended), David Wadhwani told the NY audience that there would be “One More Thing” – everyone would be going home with their own Ink and Slide hardware. A woman sitting near me literally flipped out. You know those clips you see when the Beatles or Elvis performed on the Ed Sullivan show? Yeah, it was like that. 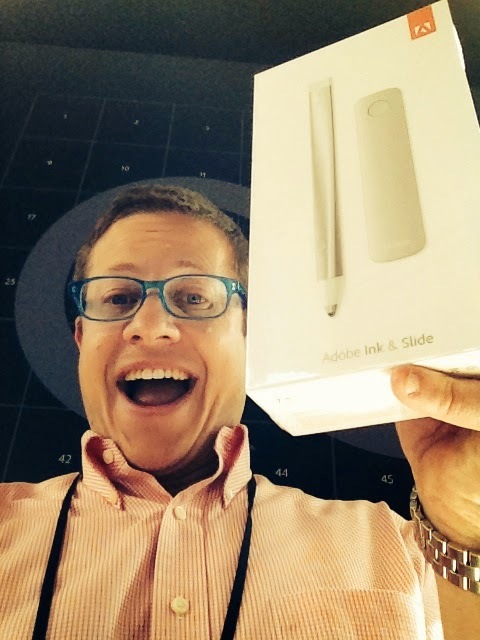 Adobe Ink and Slide is sold as a single package for $199 from Adobe’s website, and since there’s a lot of interest in it, I thought I’d document my own first experiences. 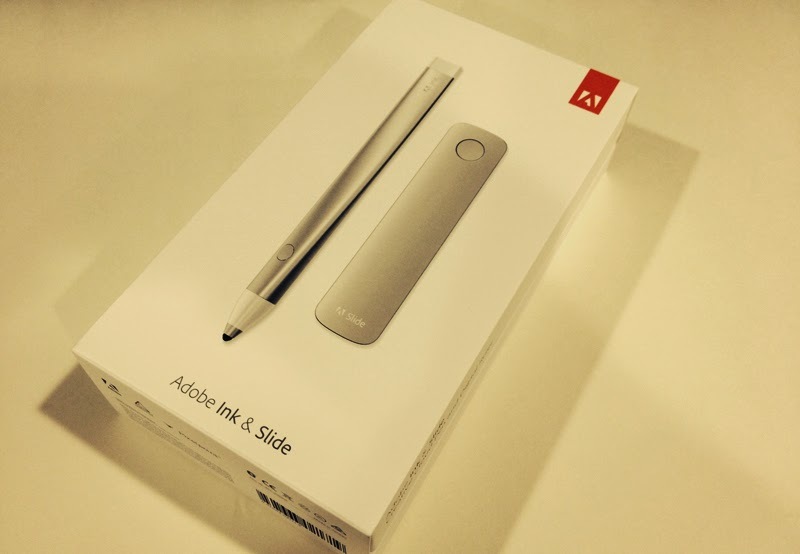 So here is my unboxing and first impressions with Adobe’s first hardware offering. As you would expect from Adobe, the packaging is beautiful. One of the Adobe product managers told me that the team was as proud of the packaging as they were of the product they’ve built. The packaging has the look and feel of something from Apple. Clean and white. So basically, the contents of the box are Ink (the pen), Slide (the ruler), a carrying case/charger, a USB cable, and a cleaning cloth. I figured I’d charge Ink (Slide doesn’t require any power to work), and plugged it into the USB port on my computer. 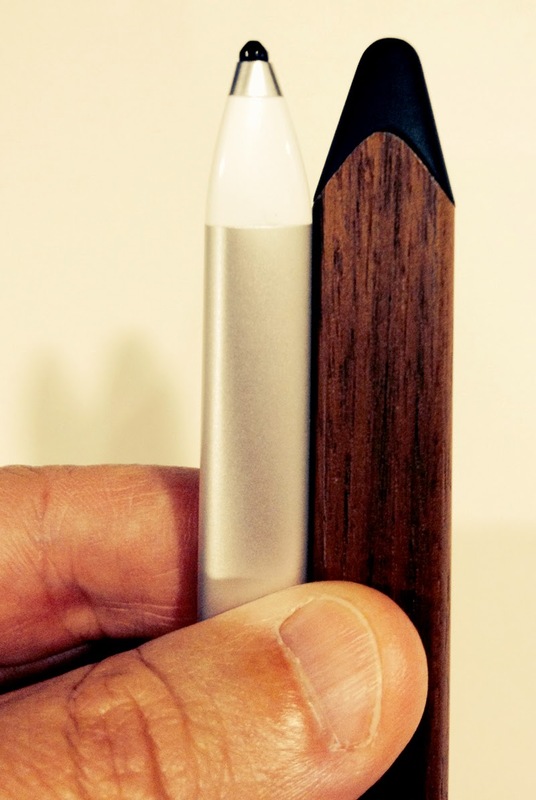 The charger is magnetized, so Ink slides right in and “snaps” into place. 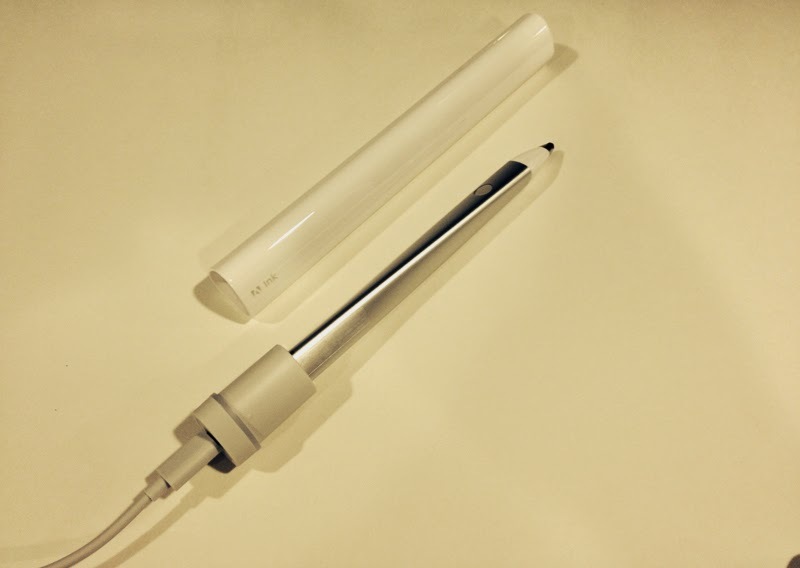 An LED ring around the base of the charger glows and pulsates, indicating that Ink is charging. I’m red-green color blind, and one of the most annoying things about technology is that just about EVERY digital indicator uses red/green/amber to indicate some form of status. News flash to all those engineers out there – THEY ALL LOOK THE SAME TO COLOR BLIND PEOPLE. 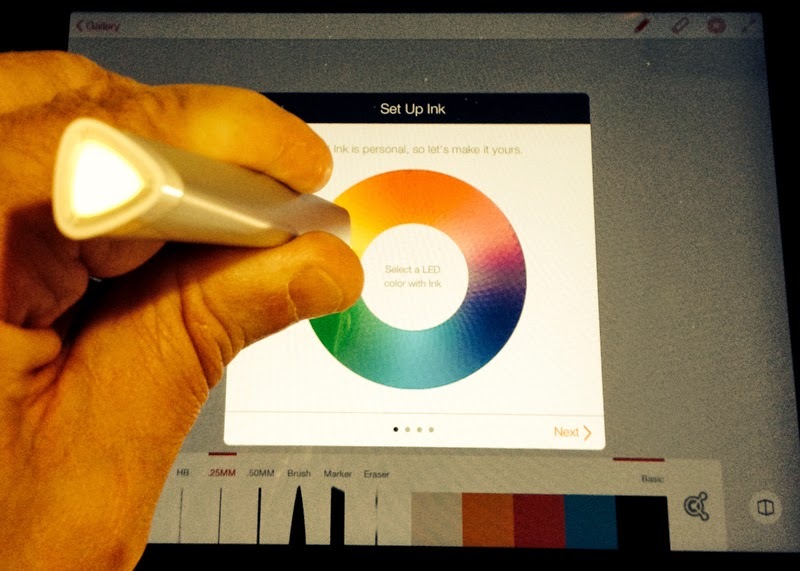 The folks at Adobe are very kind to us color blind folk (there are cool features in Photoshop and Illustrator to simulate how your designs will look to people who are color blind), so while Ink is charging, the LED pulses. But once Ink is fully charged, the LED glows solid and cycles through all the colors of the rainbow. 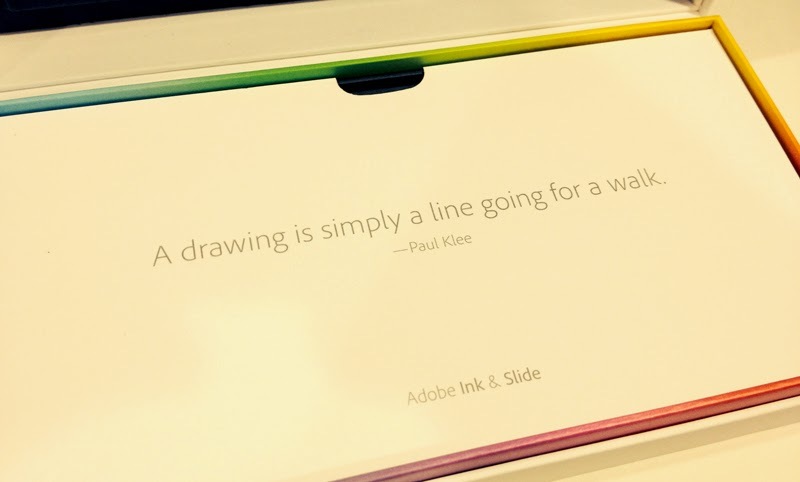 Kudos to Adobe for really thinking about these details. At this point, I’m ready to start using Ink and Slide. 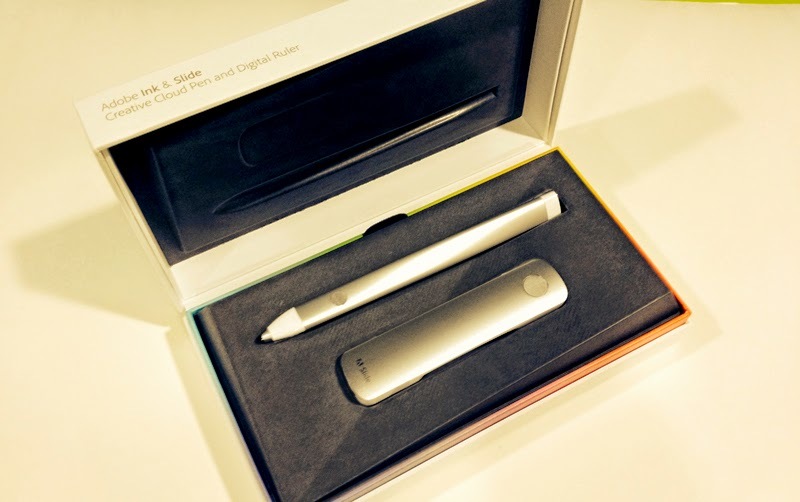 To turn Ink on, I press and hold on the button on the barrel of the pen until the LED at the top of the pen starts to glow with all colors of the rainbow. With Ink now powered up, I’m ready. To start, I’ll need to download the two new mobile apps to my iPad -- I have the iPad Mini (regular, not Retina). I downloaded both Adobe Line and Adobe Sketch. To start, I’ll use Adobe Line. After launching Adobe Line, I am prompted to sign in with my Adobe Creative Cloud account. And in order to get started with using Ink, I have to open a document (or create a new one). At the upper right of the screen, I can click on the Pen icon to pair Ink, which I do by holding the tip of Ink to the red target circle for a few seconds. 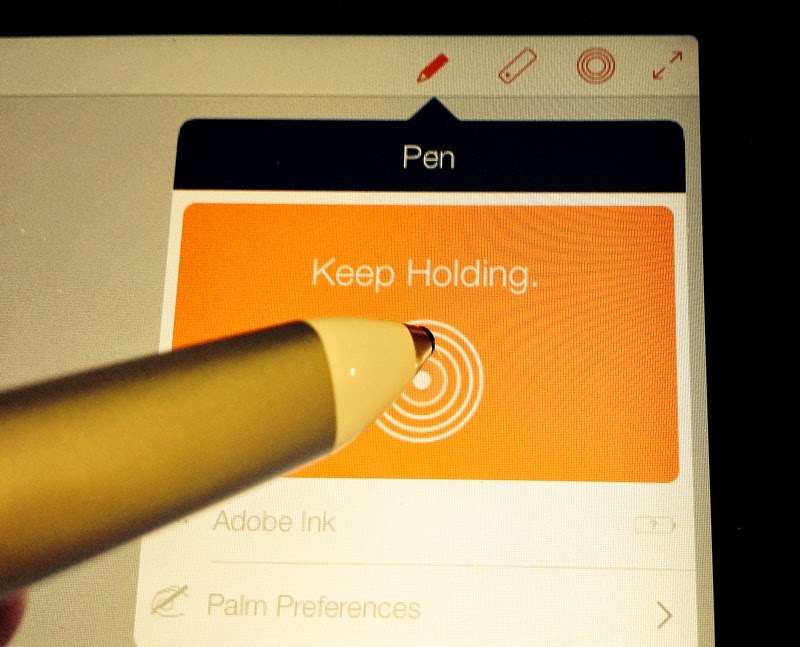 Next, I tap the Edit Ink button to set up and personalize my Ink, which is a 4-step process. First, I choose a color. 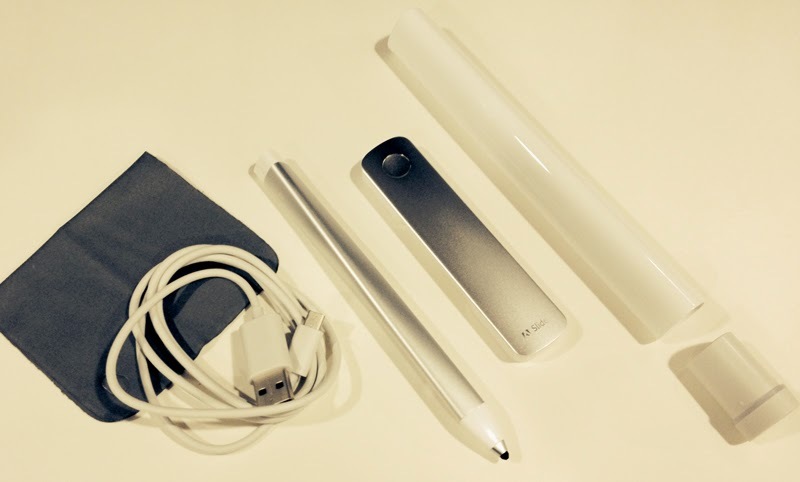 Ink is highly personalized and in an environment where there may be other Inks around, I want to be able to quickly identify mine by the color of the LED at the top of the pen. 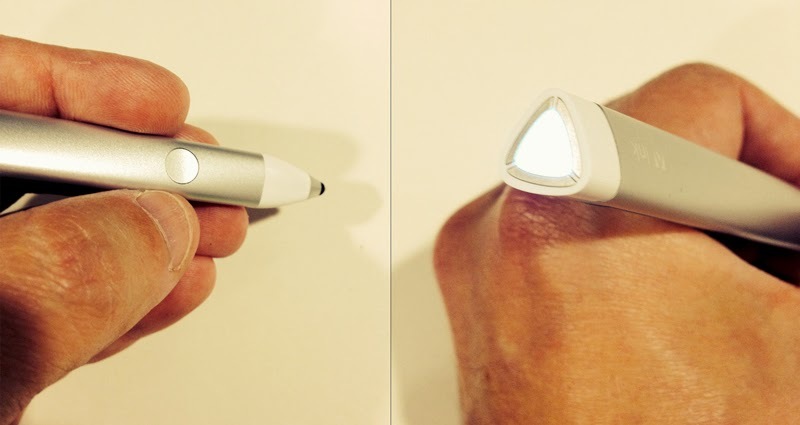 Pretty cool, as I move the pen around the color wheel, the LED glows with that color, helping me choose. Naturally, I choose yellow. Next I give my Ink a name. Then, I get to choose a profile that matches how I hold a pen. This helps with palm rejection. I’m a lefty, so I find this very helpful. The final step is to link my Ink to my Creative Cloud account, which will allow me to use Ink to access things like my kuler themes and or clipboard items. With that done, I’m now ready to draw! I’ll post detailed reviews of my experiences with the mobile apps (Line and Sketch) after I’d had more time to play with them, but I wanted to get a feel for what the experience would be like to work with Adobe Ink and Slide, both in regard to their immediate functions as a pen and ruler, and also in regard to Adobe's integration with these tools and my Creative Cloud account. Ink: The pen feels nice in the hand, although a tad bit light for my own tastes. The pixelpoint tip is fantastic. Finally a point that's not a mushy rubbery blob. That being said, the point is made of hard plastic, and using it on the glass surface of the iPad is noisy. Noticeably. I mean, if you're in a meeting trying to take notes, I can see this being an issue, especially if a few people are using it. If you are annoyed or sensitive to those folks who pound the keyboard typing, this is pretty much what it sounds like. Also, the tiny point reveals an issue that folks who have used the Wacom Cintiq displays have had to deal with -- a noticeable distance between the point of the pen and the pixels that appear on the screen beneath the glass. The pen itself though performs well and there's no lag that I can tell. 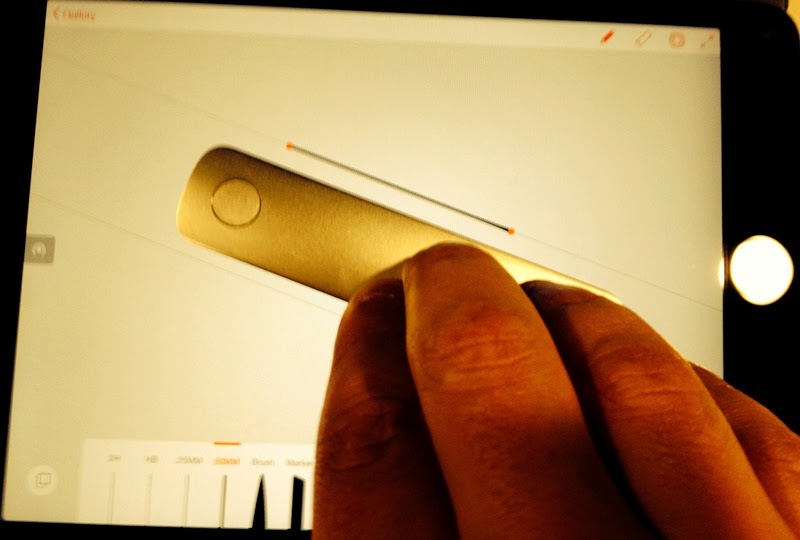 Also, the marks that this pen makes in Adobe's mobile apps are GORGEOUS. Even little blobs of ink as you start a line, etc. This really mimics real life media extremely well. Even the fact that you have two pencils to choose from (2H and HB) is a sign of what you're dealing with here. I really miss having an eraser on the flipside of the pen though. Some folks know I love my Pencil from Fifty Three -- here's a closeup comparing the tips of Pencil and Ink. No contest here -- Ink wins hands down. Slide: The concept of Slide is pure genius. Brilliance that you would expect from Adobe. 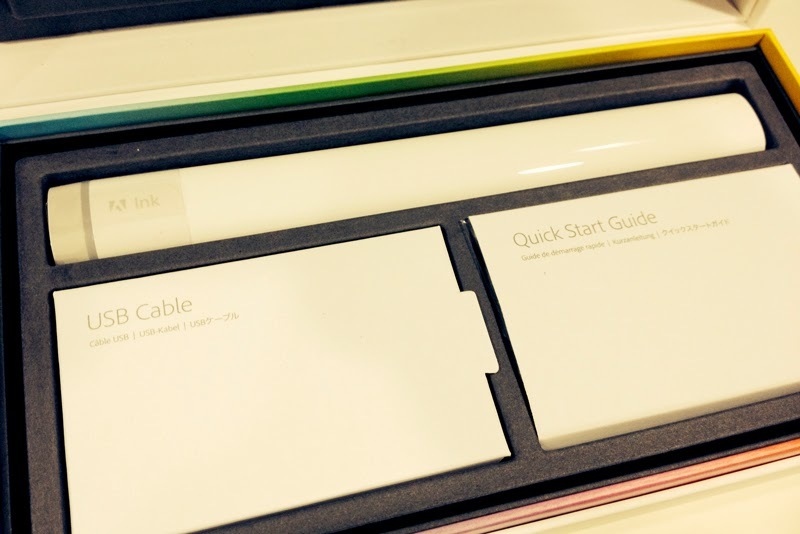 Everything that Slide does is not only useful, but incredibly important to designers. That being said, the hardware itself is unnecessary, mainly because Adobe has built the functionality of Slide into the mobile apps... you can use your fingers to accomplish the same tasks. So Slide ends up being more of a gimmick. And here's what it looks like when I have the Slide functionality turned on in the app (it's that little circle you tap in the upper right menu to activate it) and using my fingers to do the same. Because you have to use your fingers to scale your shapes anyway, you need a few extra hands to make all this work (one to hold Ink, one to hold Slide, one to scale the shapes or stamps), and if you like to prop your iPad up on an angle while you draw like I do, then Slide literally slides right off the iPad. 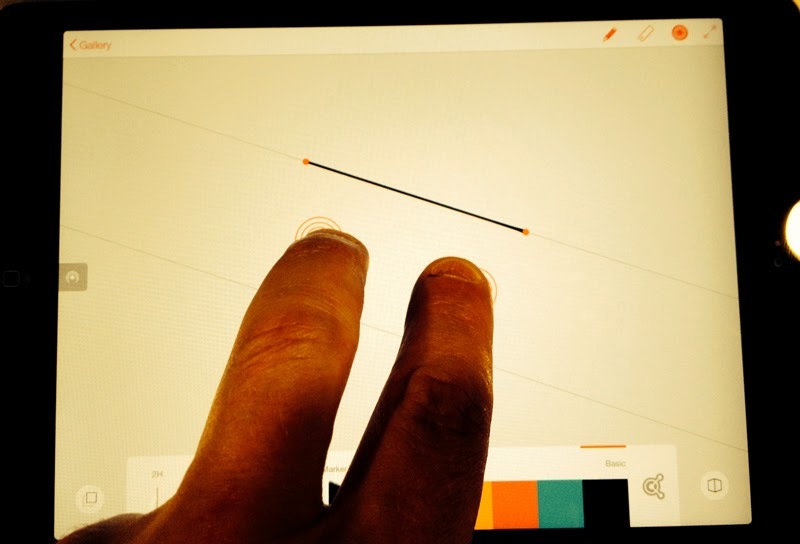 Also, if you're drawing on your lap, you'll need a pair of hands to also hold your iPad. Don't let this take away how valuable the functionality of Slide is. 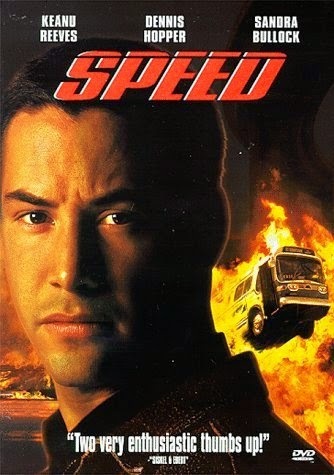 It's brilliant and incredible. I just don't need the hardware (one more thing to get lost). 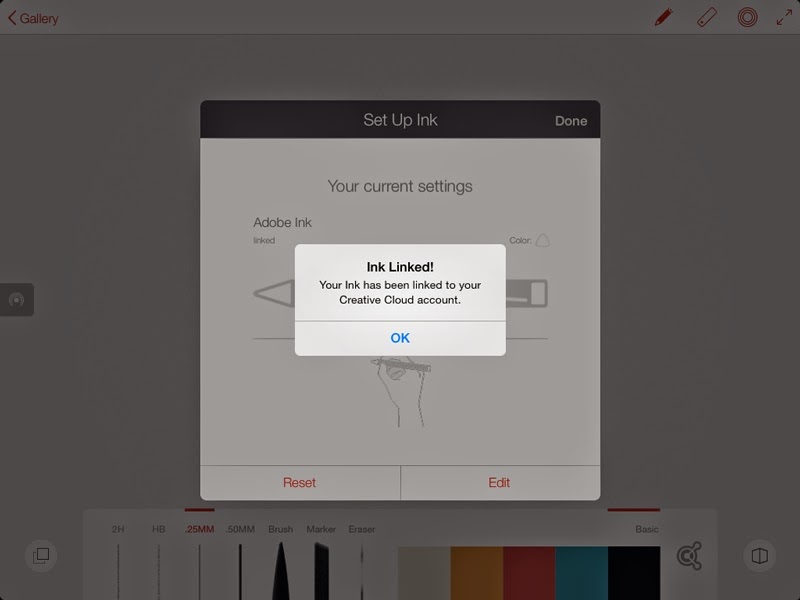 Creative Cloud integration: When you press the button on Ink while using Adobe's mobile apps, a menu pops up offering 5 options: Switch tips/tools, Choose colors, Choose shapes/stamps for use with Slide, Share, and Clipboard. This menu is most useful when you work in fullscreen mode and hide the UI elements so that you can focus on your drawing. Switching tips/tools works as you'd expect. 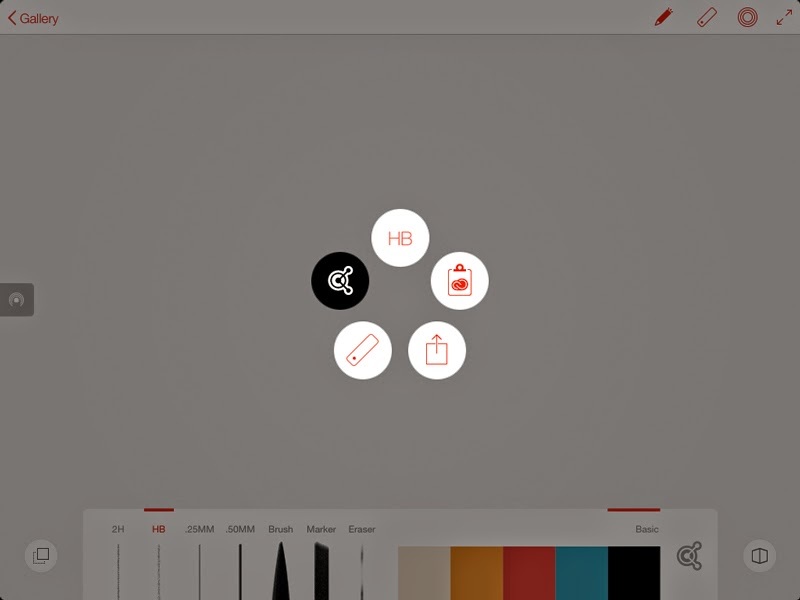 Choosing colors lets you connect to your own Kuler themes that you've created or you can browse any that live in the Kuler world. However, the experience is lacking. No search, and you don't see the names of the themes until you've loaded them into your document. Again, as a color blind person, I can't tell colors just by looking at them, so I need to see the names of colors. I'm hoping that in future updates, this experience will get much better. Slide lets you use a variety of guides, shapes, and stamps, and tapping the Slide button gives you access to these. I cannot overstate how important and wonderful these are and how much they add to the drawing experience. But again, you don't need the actual Slide hardware to access and use this. Sharing works as you'd expect, with the added coolness of being able to send your art directly to your desktop in Illustrator or Photoshop. Haven't been able to make that work yet, but I'm sure it's user error on my part. Finally, the Creative Cloud clipboard is cool in concept. 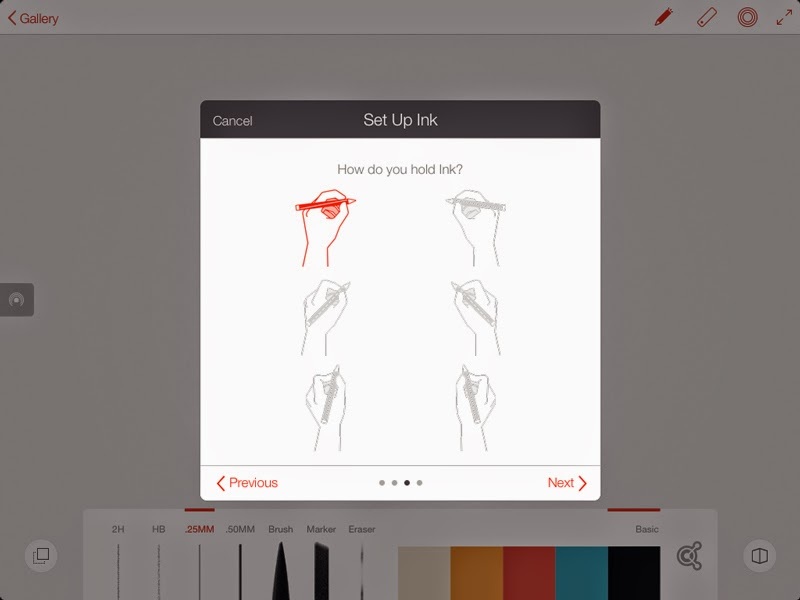 Basically you can press the button on Ink and hold the pen to the tablet for a second or two and it copies your art to the clipboard. You can then paste it anywhere else. Your clipboard can contain multiple items (kind of like how InDesign lets you store multiple items on a clipboard). However, the experience is a bit clunky or slow. I assume that will only get better as Adobe makes software improvements. The concept is sound however, and I'd think it will be useful. Overall, I like Ink a lot. And while pricey at $199, the functionality and promise are worth the price, especially if you buy into the idea of Creative Cloud and see that as your tool of choice in your design career. In an Apple kind of way, Adobe has proven it can own the experience -- and build a tool that integrates well with software (and perhaps that's why they haven't support Android yet because maybe they can't deliver it there yet). Got questions? Comments? Want to share your own experience? I welcome all questions and comments!